Learning how to see a color correctly and paint it is a challenge for a lot of beginning artists. Even if you have painted for a while, it may not come to you naturally; it requires a certain amount of mental discipline to develop. Painting and drawing are really about seeing, but the process of discerning colors, lines, or tones, can be intimidating for a lot of artists. Growing up, we develop preconceived notions of what colors the objects around us should have. For example, most people would say an apple is red, a tangerine is orange, an egg is white, etc. It is an easy and convenient thing to do. When our minds expect something to have a certain color, this kind of thinking gets in the way of really seeing the true color. On top of that, your personal preference for some hues can also affect how you see colors. Take a look around you: some things have pure colors, while others have grayed colors. Man-made objects are more likely to have pure colors than things in nature. But in spite of that generalization, you will find plenty of pure colors in nature if you look for them. Flower petals and a brilliant sunset are just two examples of natural pure colors. To understand how to see colors correctly, remember that the light falling on an object has a major influence on its color. Take an orange for example. If you look at it, your brain will tell you to expect it to have an orange color all over. When placed under a bright light, however, the orange will have an almost white area that is called highlight, and the part of the orange that is in shadow will be red-orange or a bluish orange. The shadow cast by the orange will vary depending on the color of the surface it is sitting on. Plus, if the orange is next to another object with a different color, the shadow will be affected. If a banana is next to the orange, for example, the shadow of the orange will have a yellow glow. If it is next to an eggplant, the orange's shadow will look more violet. As artists, you must learn to paint the effect of light, with all the variations of hue, tone, and intensity. Stay aware of your mental stereotypes of what the color “should” be. Claude Monet's famous paintings of haystacks is a good illustration of how to paint the effect of light on an object. His haystacks take on different colors depending on the light conditions. Your eyes still can read them as haystacks, not something else associated with the colors he painted. If this sounds complicated, be encouraged, because you can train your eyes to identify colors. This is truly a 'handy' color checker! Curl your hand into a fist, leaving a small space less than half an inch (1 cm) in diameter through which you look at the object of interest. Close your other eye and this method will allow you to look at colors in isolation from the form of the object and the other colors around it. You will be amazed at how quickly you will be able identify colors using this method. This method is more of an extension of the Curled Fist Method. You roll up a piece of paper to make a narrow, half inch (1 cm) tube. Close one eye and look through the tube at the color in front of you. In a way, you are making a mini-telescope to see colors instead of stars. Take a gray scale card. Punch out tiny holes in the middle of all the value levels on your gray scale card and look at the color through the holes. 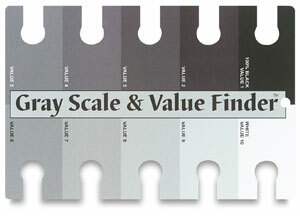 This not only helps you isolate the color but also assists you in finding the value. Your state of mind is also a key factor in learning how to see a color. If you relax your mind and eyes, and look past the object, you will more quickly be able to identify its color. So scan the color and allow your eyes to roam around the object. Don't fix your eyes on the object; look past it. Our memory of colors is very short and often deceptive. For instance, if I tried to mix the color of the sweater my friend wore yesterday, I would fail miserably! So you don't want to have to rely on your memory when working with colors. Many times, when you try to stare at something too long, your eyes tire, and then you lose the visual alertness you need to identify colors. Take occasional breaks from your painting and look into a dark, shadowy area. Or, if you are painting outdoors, go indoors for a minute (and vice versa). 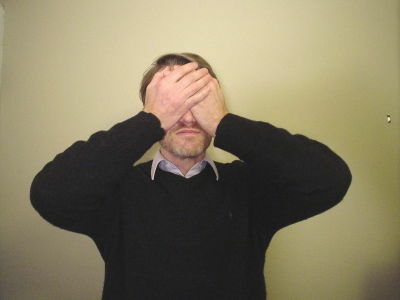 You can also use a simple exercise, called 'palming' to help your eyes recover from fatigue. Close your eyes and cover them with the palms of your hands. Position the lower part of your palms on your cheekbones, and overlap the fingers of both hands on your forehead. Don't press on your eyes; instead, make room with the hollow part of your palms for your eyes to open or blink. Hold the position and let your eyes rest for five or ten seconds. I hope by now you have an idea of how artists look at colors. With a bit of practice of the above techniques, you will be amazed, like my students were, at how easy it is to learn how to see color.